1898-1901: Janet Elizabeth Mesher (née MacDonald1870-1946) was the original owner of this property. She and her husband, George Charles Mesher (1860-1938) lived at 154 South Turner St, James Bay, when this house was built. 1921-24: David Leeming (b. Manchester, ENG 1876- 1939) and Amy Theresa (née McKenzie, b.Victoria 1881-1958) married in 1908. 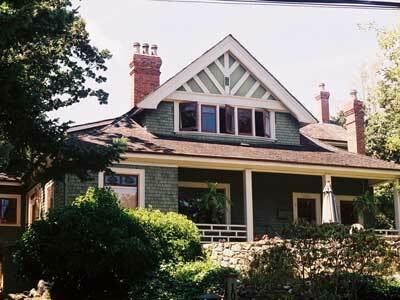 David came to Victoria in 1894, and he worked in real estate and customs. In 1922-23 he was a member of Victoria City Council, then served as mayor from 1931-36. David was for many years president or a director of the Victoria & Island Publicity Bureau, an active member of the Chamber of Commerce and was president of the Victoria Real Estate Board at the time of his death. 1925-45: Lt.-Gen. Sir Percy Henry Noel Lake (b. Wales 1855-1940) was educated at Uppingham School, Rutland, ENG. Joining the militia in the early 1870s, he served in the 1878-79 Afghan War. His first Canadian appointment was as Quartermaster-General of the militia in 1894-98; from 1904-08 he was Chief of General Staff. He became Chief of General Staff for India in 1912, and by 1916 was commanding the army in Mesopotamia. Percy retired in 1919 and came to Victoria in 1923 with his wife Lady Hester Fanny (née Woodyer, 1852-1945). 1948-51: The house was converted to suites, and Aeta and Thomas H. Irving lived here until 1951. 1949- 60s: Retired Commander Charles Taschereau Beard (b. Ottawa 1890-1950) and his wife Kathleen Adele (née Kemp). Kathleen remained in the house many years after Charles’s death. Charles was sent to England in 1897 to get a maritime education. He returned to Canada and joined the RCN in 1910, and served overseas during both World Wars. In 1922 he became Senior Naval Officer, Esquimalt, and Captain of Naden. Later he held various posts at RCN Headquarters, including Director of both Naval Reserves and Naval Operations. He returned to Naden as Commanding Officer in 1936. In WWII, Charles commanded the HMCS Prince Robert, stationed off the coast of Mexico, where the vessel captured the enemy ship Weser. After retiring, Charles represented Esquimalt in the BC Legislature for six years.